It seems that women’s sports have never been more popular and the AFLW competition has attracted huge interest. In fact, women playing Aussie Rules is the fastest growing segment of that game. While it is great that women are participating in sport in record numbers, have we seen the same growth in women in leadership roles in Australian sport? Why is there not the same upward trajectory for women in leadership? 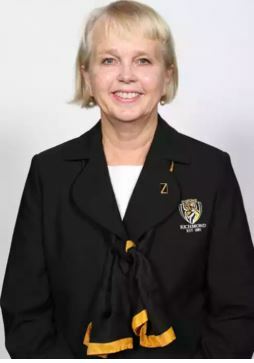 Peggy has committed to challenging the visibility of women’s leadership in Australia, appointed as the first female president of the Richmond Football Club in October 2013 and recognised in 2018 with an honorary Doctor of Laws from Swinburne University for her work in gender equality and development of leaders in sport. In April 2018, she was appointed to the AFL’s Competition Committee. Peggy is a consultant to Lander & Rogers and has specialised in superannuation and financial services law for more than 20 years. She was previously a partner at Herbert Smith Freehills. In August 2014 she was appointed to chair the Victorian Minister for Sport’s year-long inquiry into ‘Women and Girls in Sport and Active Recreation’ and was convenor of the Minister’s Change Our Game Champions program until July 2018. In August 2017, Peggy was appointed to Victoria’s Ministerial Council on Women’s Equality. In September 2014 Peggy was named as one of the Financial Review/Westpac 100 Women of Influence and as one of the Women’s Weekly 50 Most Powerful Women in Australia. Peggy is also a Fellow of the Australian Institute of Company Directors, a member of the Carbine Club, Chief Executive Women AND most importantly, a member of the Melbourne Forum!